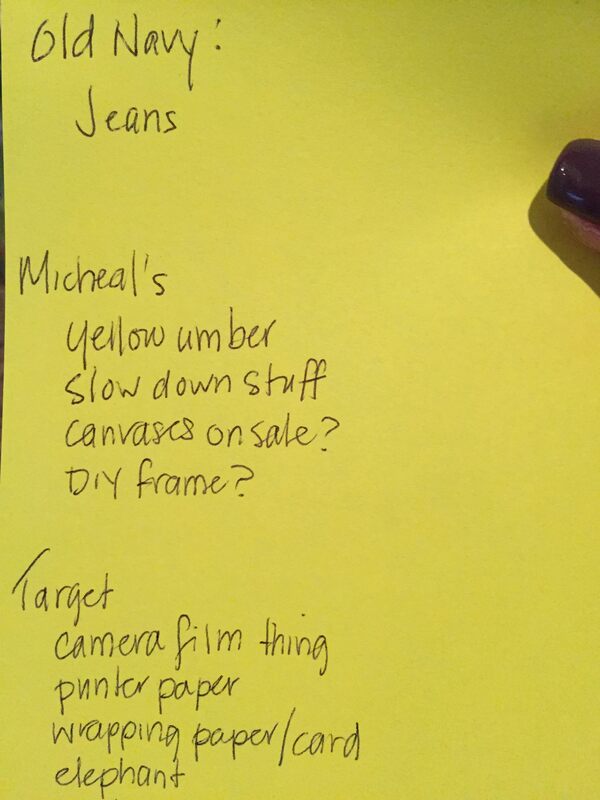 That picture up there is of a list I made for my various shopping destinations. I try to do everything on one day because I never know when I’ll have another one where I feel well enough to get out. You know that you’re in a fog when you have to write “jeans” as the item to purchase at Old Navy because Old Navy pretty much doesn’t sell anything but jeans. Although I suppose there is an Old Navy for things like battleships and pea coats but the need for those things seems to be pretty rare, especially when you live in an apartment and rarely go outside. But that’s what it’s like having TN. Sometimes even the obvious eludes us. My kitchen counter is usually speckled with bright post-it note reminders of everything from “Make doctor’s appointment” to “run dishwasher”. Sometimes I have a hard time remembering whether one of my scraps of paper lists something I’ve already done or something I’ve yet to do. “$#%@!! !,” I think. My dream of getting three pair of pants that actually fit for $45 now shot. And I was happy once again. I don’t need an Old Navy credit card, but the 40% off would pretty much get my jeans purchase down to my goal $15 of pair. I merrily go into the fitting room and try some jeans on, my euphoria over getting a good deal masking my disappointment at the size of jeans I now need. And I kept my eyes on the prize. Jeans and jeans only. Nothing else was in the budget. I exit the fitting rooms with my three pairs of jeans and head to the cashier, ignoring all those little doo-dads and candy they have in the snaking path to the counter. I was a little proud of myself, for my attraction to anything colorful or shiny sometimes results in a lot of unneeded stuff in my shopping bags. I don’t have an effing job. Oh, I’ve got a great FICO score, more than $45 in the bank and credit cards that I use responsibly, but I don’t have an effing job. Heck I got an American Express card when I was nineteen, I’m so responsible with money. But when I was nineteen I actually had an effing job. “Oh, people are rarely declined,” the cashier said, handing back my license. Then we both stood there waiting for what seemed like hours but was really 30 seconds. I needed to save face so I still bought one pair of jeans. Then, feeling dejected, I headed toward home. I needed a little pick-me-up, so I stopped at Portillo’s and got a chocolate malted. I haven’t had one in months and it hit the spot, making my disappointment of a day a little bit better. The only problem? Once I had the malted, my new jeans no longer fit.